Testing module in Targetprocess helps to organize Test Cases with hierarchically structured Test Plans and connect Test Plans to work items such as User Stories. Count of test cases in test plans, count of test cases for user stories are key metrics for tests coverage tracking. This article describes the counters, metrics, and reports for user story test cases count. 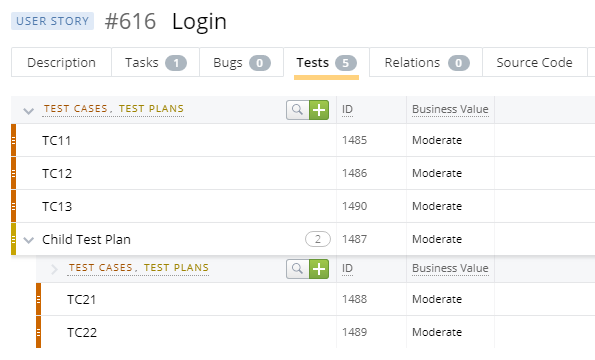 After release of Entity Test Plan feature, Test Cases are connected to User Stories within linked Test Plan. 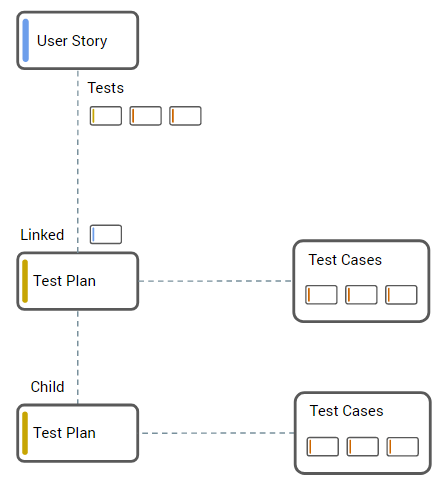 Linked test plan may contain test cases and child test plans with test cases, and all the plans and cases are displayed in Tests tab in User Story detailed view. Full total count of user story test cases includes the test cases directly related to a linked test plan of the user story and the ones in child test plans with unlimited depth. Total number of test cases for a user story is displayed in the header of the Tests tab of its detailed view. The count is also available as Customize Cards unit for cards on views. In Visual Reports with User Stories data source, the count is available as predefined field named Linked Test Plan All Test Cases Count. Add the field manually to the list of Data fields, then use it as axis or label dimension for your visual report. In Tabular Reports with User Stories data source, the full count is not available out of box. User Story Test Cases collection is supported in Summary Columns, and it provides total count of test cases directly related to a linked test plan of the user story. However total count of test cases in child test plans is not included. We recommend to address the problem with special solution based on custom calculations. This custom calculation populates custom fields with full total count of user story test cases: the ones directly related to a linked test plan of the user story and the ones in child test plans with unlimited depth. The calculated values appear in Tabular Reports with User Stories data source. Add numeric system custom fields first. Then configure custom formula metrics to populate the fields. Changes described below are performed by Administrators. Modify custom fields and metrics settings in the particular Process your Project follows. Add two pairs of custom fields and related metrics. Once the custom calculations are configured, the Test Cases Count column appears available in Tabular Reports with User Stories data source. The column is available in reports based on single particular process only.